Aleppo’s liberation one year ago today: Anybody ashamed? • December 12, 2017, marks the anniversary of the liberation – the West called it fall – of Aleppo in Syria. What happened is conveniently forgotten today by the West. Some of us can’t and won’t forget what was both world, regional and local history. 1. The Western mainstream media’s deceptive – constructed, ignorant, or both – narrative since 2011 was debunked. • History and the colonialists’ role in Syria. • The immense complexity of the Syrian society. • Syria as a 7000 year-old civilisation and as end of the Silk Road. • The decades-long conflicts underlying the violence, since CIA’s coup in 1949. • The Western-driven regime change policies years since before 2011. • Other causes of the conflicts than “Assad the dictator and his regime” such as environmental crisis, oil and gas, and its being partly occupied since 1967 by Israel. • That this may have been a civil war for about a week but then almost 7 years of international aggression by thousands of foreign groups, Western governments/arm suppliers and their Saudi-led allies. • Syria’s right under such circumstances to self-defence according to Article 51 of the UN Charter. • That Russia and Iran was the only foreign powers legitimately present according to international law. • That the UN was sidelined – again – and tasked with the impossible role of making peace out of such member state policies. • The media interest in Syria disappeared immediately after Aleppo’s liberation as if orchestrated by one conductor. Silence. The media coverage stopped there and then – like musicians under a conductor, obeying the tiniest move. It had started formally on Dec 12, 2012 – on the day four years earlier, in Marrakesh. “Friends (!) of Syria” declared Assad’s government illegitimate and set up a Syrian National Council – without, of course, asking the Syrian people it was supposed to represent. Here’s AlJazeera’s/AFP’s coverage of that cruel decision. With Aleppo lost, the RIOTs – Rebels-Insurgency-Opposition-Terrorists – lost momentum. The Free-this-and-that ran away, dispersed or killed each other. And the West’s beloved White Helmets – with their stolen name doing humanitarian work only among terrorists – were nowhere to be seen in Aleppo on December 12. Anybody in a NATO Ministry of Foreign Affairs, “intelligence agency” or state-financed research institute could have found out on the Internet what that organisation in reality was. They did not. For obvious reasons. But I could and did in November 2016. After Vietnam, Somalia, Yugoslavia, Afghanistan, Iraq, Libya etc. this was one more international law-defying military intervention to impose – allegedly – the best of the Western values in its Mission Civilisatrice but predictably lost, one more contribution to the decline and fall of the West, the US Empire and NATO in particular. And one more positioning on the wrong side of history. 5. One more example of the inability to feel empathy with the human suffering in the wake of our policies. 300 000-400 000 innocent civilians dead, millions displaced and barely surviving outside Syria. History and civilisation destroyed directly or by militant, terrorist proxies – Western supported RIOTs. And civil society of course was never a player in any negotiations – only the killing groups and countries have met at tables: Complete conflict and peace illiteracy at best or a cruel wish to just destroy and conquer. Also, it never occurred to the media and politics that you could side with the innocent, non-killing Syrian people. No, you either sided with “the regime” or with the West and its allies against it. If truth is the first casualty in war, conflict understanding and respect for complexity is the second and third. Our own complicity the fourth. Even if President Assad had been the worst dictator on earth since Hitler, nothing can justify our – US/NATO countries – complicity in human suffering of such proportions. Has any Western politician or government expressed regret? Has any leading media apologised for its coverage? Did the so-called Left, labour unions or workers around the world express solidarity with the 30 000 workers and their families whose lives were destroyed in Aleppo’s Sheikh Najjar Industrial Zone that produced 5% of the industrial goods in Syria and was the second largest industrial zone in the Middle East? Does anyone talk about reconciliation with Syria, about a History and Reconciliation Commission for all the war and not just some politicised “Commissions” to investigate single attacks – so the blame game can go on? Or – as repentant gesture – about a huge program for re-building Syria? No. There is no shame. And we expect people in the Middle East to love us, right? But China is connecting the vast Eurasian continent with a constructive new Silk Belt and Road from Beijing to Serbia. Positive energy, big vision, potentially peace-promoting like nothing else at the moment. Some 25 years ago the First Cold War ended. The Soviet Union and the Warsaw Pact fell. Militarised to death and stuck in Afghanistan. Today we could have had a much better, peaceful West and good relations with Russia. We don’t. Now the West has been in Afghanistan for more than twice the time Russia was – unfortunately it has nobody even remotely comparable to Gorbachev, the last SU President. Instead the West fought wars all over the place and expanded NATO – against all promised made to Gorbachev – when it should have dissolved and a new security structure been built. NATO allies blindly following the US – their Master’s Voice – without one independent or doubtful thought. We are now in a new, but different, Second Cold War. Syria is about that too. That Second Cold War will be lost by the US and NATO countries, the West. And for the Syrian people, for those who never touched a gun? As sad as can be. We caused the world’s largest humanitarian crisis (at the time) since 1945 for nothing. Perhaps 400 000 died and millions are internally displaced or refugees in neighbouring states. Better forget it. And move on to new wars – North Korea, Iran…who’s next? 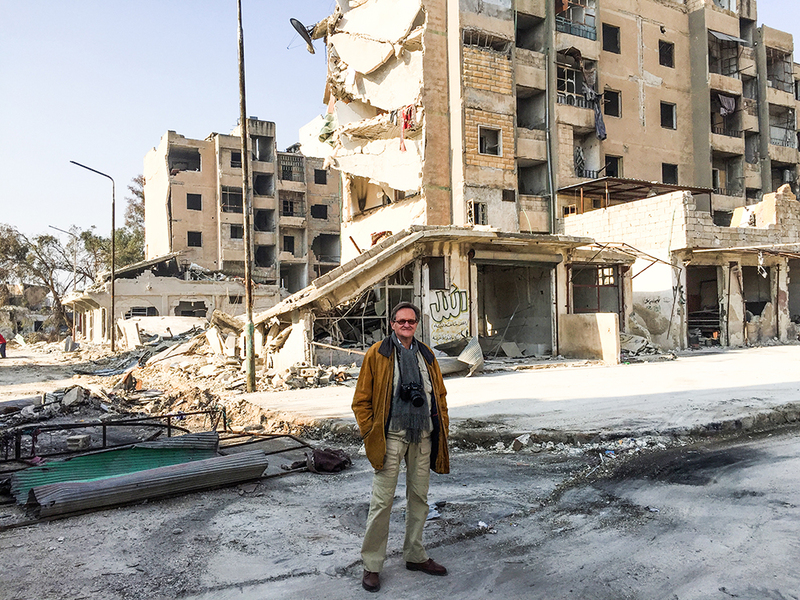 I’ve seen much destruction during my years of work in conflict and war zones. But nothing like Aleppo East, the old City and Aleppo’s industrial zone. Square kilometer after kilometer of destruction – only 5-7% of it from the air, for those who want to know, the rest done by house-to-house fighting. Trillions of bullets. I’ve seen the suffering – but also the joy – of the people in the East and those who came over to the West to get help – the only helpers present there on December 10-14 were the Red Crescent, Russian field doctors and hospitals, the Syrian Arab Army and volunteers from Aleppo’s University. Shocking. And deeply deeply moving. Never to leave my memory. No normal person who has seen what I saw would be able thereafter to defend war as a tool to achieve any political goal whatsoever. Decision-makers and media outside Syria simply won’t get it. Distance and psychic numbing, the shields around the corridors of power kill. I don’t blame them for not risking their lives going there. I blame them for their colonialist mentality and their belief in their own exceptionalist moral superiority. The next shock I experiened – perhaps due to my belief in decency and professionalism but anyhow proving naive – happened at my attempts to reach media with what I had seen. TFF PressInfo reaches, among others, some 3000-4000 media and journalists worldwide, including many hundreds in the Nordic countries. Not one reaction was expressive of an interest in what I had seen in a place where I was the only one from the Nordic countries and Western media had been present but had left before December 12, 2016. But writing in safety from Beirut, Istanbul, Paris, Berlin and Washington they knew that with Aleppo’s ”fall” the next thing would be Assad’s genocide on its inhabitants – who somewhat surprisingly to them, I reported, cried of happiness to have come out from under 4,5 years of terror occupation, danced, drank and celebrated in the streets. I talked freely with anyone in those streets and was not embedded – but did get military protection in and out of Aleppo’s war zones at a time when all the fighting had not died down yet. I was grateful for that, necessary in such a dangerous environment. During my work in Yugoslavia’s dissolution wars, in Georgia, in Iraq – there was always some media somewhere that said: OK, he has been there, he knows about conflict analysis, he has talked with people on all sides and represents no government. He’s independent, let’s hear what he has to say. In the case of Syria? Not so. In this case I also produced 6 photo documentary series – seen by 134 000 people here but not one of the images used by mainstream media. So, there were not even the tiniest crack in the massive media wall – media that could have seen interviewing me as a kind of scoop since they had nobody there. Also not in my regional, leading media such as Dagens Nyheter, Sydsvenskan, Politiken, Berlingske, 24/7, Deadline – you name them. Their responses are all documented here. And the liberal The Nation, the oldest political magazine in the US, asked me to summarise three articles they had read into one – only to tell me that they had rather suddenly “changed editorial priorities” and would, therefore, not publish my manuscript but pay me a honorarium (which I had not even asked for). No response or ”we can do an interview with you about how it is for a peace researcher to be embedded with the Syrian regime/dictator and his army” – that is, only an interest in framing. No interest in what I had seen and heard. Has anyone ever been framed for going to the capitals of Western aggressors say Washington or Brussels? I was framed for risking my life going to Damascus and Aleppo to try to understand that side too, the side that has not gotten a fair hearing. So much for the free Western media – proving excellently their place as the second M in the MIMAC – the Military-Industrial-Media-Academic Complex – that is always ready to promote violence and omit or marginalise the voices of conflict understanding and peace. Just how grey are the White Helmets and their backers?